Plastic. Kayak is 8 inches long, 4 inches wide, and 3 inches tall with passenger. Removable, articulated rescue figure is 4 inches tall and 2 inches wide. 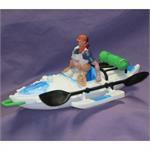 Recommended as sandtray / sandplay figures or for more general play therapy. Heavy resin. 5.75" long, 3.25" wide. Recommended as a sandtray / sandplay figure. Metal and plastic. Pull-back action. 5" long, 2" wide, 1.5" wide. Recommended as a more general play therapy tool. Can be used in the sandtray but sand will clog the pull-back action. Plastic. Set of 2. 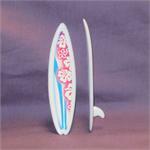 3.5" by .75". Design varies. Recommended as sandtray / sandplay miniatures. Hard plastic. Set of 3. 1.75" by .5". Recommended as sandtray / sandplay miniatures or for more general play therapy. Plastic. 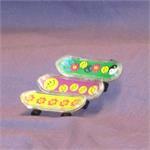 2.5" tall, 3" long rollerblades. 4" long, 1" wide skateboard. 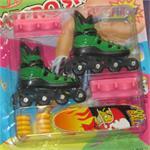 Includes extra set of rollerblade wheels, tool for changing them and skate stand. Recommended as sandtray / sandplay toys or for more general play therapy. Plastic. Set of two. 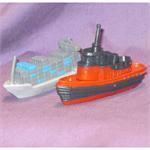 2.75" long, 1.75" tall tug boat. 2.5" long, 1.25" tall cargo ship. 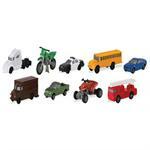 Recommended as sandtray / sandplay miniatures or for more general play therapy. Plastic. Set of two. 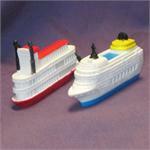 2.75" long and 1.25" tall cruise ship. 3" long and 1.5" tall paddle boat. Recommended as sandtray / sandplay miniatures or for more general play therapy. Plastic. Set of 7. From 2 inches to 3 inches. Recommended as sandtray / sandplay miniatures or for more general play therapy. Solid plastic. Set of 9. Average 2" by 1". 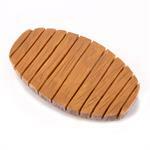 Recommended as sandtray / sandplay miniatures or for more general play therapy.